Goldstar Heathrow | Why choose Goldstar Heathrow? 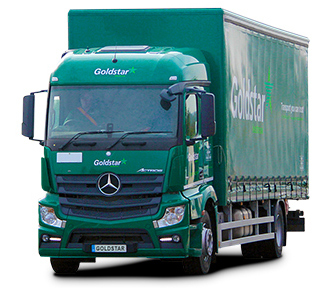 Over the last 20 years Goldstar Heathrow has grown to become one of the most trustworthy haulage companies in the UK. We understand the importance of good service and honesty within the transport industry and offer a fully professional and reliable service. Our extensive fleet of vehicles enables us to offer a comprehensive range of transport services for the air-freight industry as well as general haulage. Our fleet ranges from small vans to 44 Tonne tractor units with trailers. We have curtain-sided and box vehicles equipped with roller-bed and tail lifts. We can offer specialist solutions including low-loaders, sea-containers, sliding-roof trailers, refrigerated vehicles and equipment for computer and sensitive movements. We provide a nationwide delivery and collection service operating from our Colnbrook HQ at London Heathrow. Our inter airport trunking network offers competitive advantages for our customers. it connects London Heathrow with Birmingham and Manchester and their neighbouring airports. We have invested heavily in new vehicles, IT solutions, digital vehicle tracking, vehicle diagnostics, in-house driver training and a new management structure. With our team of highly experienced people and our high level of capability we can offer an effective response to your transport needs. Our flexible pricing and business model offers our customers the opportunity to avoid risk and fixed costs. We are committed to providing a highly professional, reliable and personal service to all our customers. We aim to deliver the highest standard of customer service at all times. Goldstar Heathrow Ltd is one of only a few Transport Companies in the UK that has triple UKAS ISO & OHSAS certification. We are a DfT Regulated Agent enabling us to handle SPX and/or SCO cargo for our clients. All of our staff are trained to DfT security standards appropriate to their job roles (at least to a formerly level D security level). We are also a member of the Freight Transport Association (FTA) and operate to their conditions of carriage. We have been audited and found to meet all the requirements for the FORS Bronze Standard accreditation with FORS (Fleet Operator Recognition Scheme). We are also an associate member of BIFA (British International Freight Association). We take our environmental responsibilities very seriously. We are ISO 14001 (Environmental Management) accredited. As over 95% of our carbon footprint comes from our fleet, our focus is on increasing efficiency with the overall objective of reducing emissions and our impact on the environment.